Silver Street, Ely, Cambs. UK. The path takes you back to Ely Porta (6) through which you may pass and turn right into the Gallery once more. 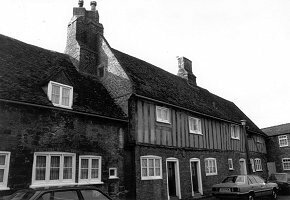 Before you proceed up the Gallery, look at the weavers' cottages along SILVER STREET (25). These buildings date from the 14th century; wall paintings recently discovered in the houses suggest this. The red brick building across Barton Square was the former Theological College and is now part of the King's School. Notice also the traditional red Telephone Kiosk on the green, it is protected by an official Preservation Order and will not be replaced! Cross the road opposite the Cathedral and take up trail A once more from the Lamb Hotel (18). This will lead you back to Oliver Cromwell's House.